The Maryland congresswoman who led the way in opposing Citizens United bids for the newly open seat. Then again, it is not often that Senate races feature candidates like Donna Edwards, the Maryland congresswoman who entered politics only after a long career as an activist on the outside demanding that Congress act on behalf of women, people of color, workers and abandoned communities. Van Hollen’s opening gambit was strong, but not strong enough to shut down the competition. The race was always expected to attract a number of candidates, as Senate seats do not come open all that frequently in Maryland. And the prospect of a competitive Democratic primary caught the attention of activists who want the party’s Senate caucus to focus on economic and social justice fundamentals and on constitutional reform of a broken political process. Progressive groups began last week to openly urge Edwards to consider a run. Democracy for America and the Progressive Change Campaign Committee launched campaigns to draft Maryland’s first African-American congresswoman into the contest. 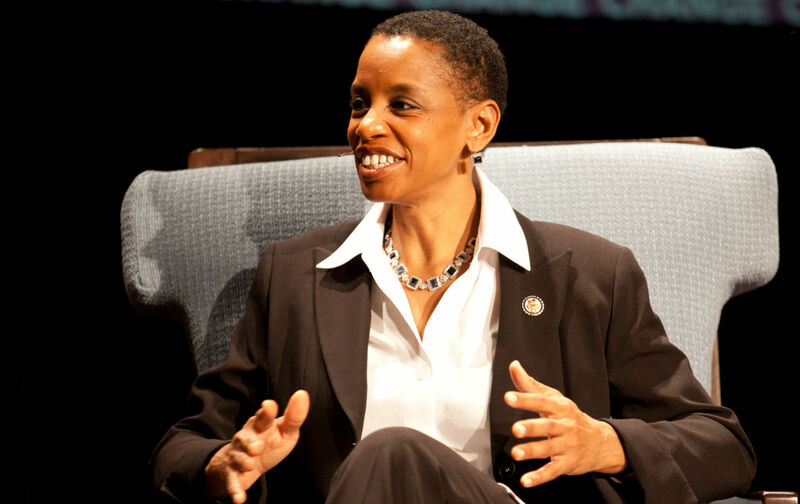 “Donna Edwards has proven time and again that she’s a bold progressive,” wrote PCCC’s Adam Green in a “Donna’s On Our Side” message. “She’s not just an ally—she’s one of us,” declared Green. Serious and issue-focused, Edwards has a record of getting out front on behalf of bold positions—even when her party is going slow. She got elected to Congress the hard way in 2008, by mounting a successful anti-war, economic-populist primary challenge to an entrenched Democratic incumbent. But her entry into electoral politics came after years of grassroots and policy activism. The first executive director of the National Network to End Domestic Violence, which she co-founded, Edwards played an important role in advocating for passage of the 1994 Violence Against Women Act. She also worked with Public Citizen and served as executive director of the Center for a New Democracy before becoming executive director of the progressive Arca Foundation, where she was a champion of media reform and efforts to clean up American politics. Since her election, Edwards has often made the connection between grassroots activism and congressional action. After the Supreme Court’s Citizens United ruling, when most Democrats were talking about tepid reforms, Edwards proposed a constitutional amendment to restore the ability of citizens and their elected representatives to enact meaningful campaign finance laws—and to prevent the bartering off of elections to the highest corporate bidder. But Edwards has always had a clear sense of which side she is on in the equation proposed a century ago by Supreme Court Justice Louis Brandeis.